Hastings Diversified Utilities Fund (HDF) has rejected APA Group's takeover offer, saying it is highly conditional and fails to provide an adequate premium for control. "The Offer is an opportunistic attempt to secure HDF's highly strategic assets. HDF is about to deliver significant revenue growth based on secure and expanding contracted revenues," it said. Hastings' chairman Alan Cameron said "Your Board regards the Offer as opportunistic and entirely inadequate given the substantial expansion opportunities which HDF has recently delivered and which will benefit HDF security holders for many years to come." HDF's Target's Statement says it has more than $4 billion of contracted revenue, which will be handed cheaply to APA if its Offer succeeds. Mr Cameron said HDF security holders who accept the Offer will not be eligible for CGT roll-over relief despite a large part of the Offer consideration being APA Stapled Securities. HDF also emphasized that it has achieved strong total security holder returns for investors since inception. DUET Group's 80 per cent subsidiary DBP Transmission (DBP) has appealed the Access Arrangement Decision by the Economic Regulation Authority of WA (ERA). DBP has applied to the Australian Competition Tribunal (ACT) for a merits review of the ERA decision to make revisions to the access arrangement for the Dampier to Bunbury Natural Gas Pipeline (DBNGP) for the 2011 to 2015 period. Sims Metal Management has made what it says is a significant minority investment in Chiho-Tiande Group Limited (CTG), a Hong Kong listed and fast growing metals and electronics recycler in China and Hong Kong. CTG is a long-standing trading partner of SimsMM. It is the largest mixed scrap metals importer in China and has three core businesses: a metal recycling business, foundry business, and wholesale scrap metal brokerage business. It has expanded into domestic ferrous and non-ferrous scrap metal recycling in Shanghai and recently announced plans to expand to Yantai and Hong Kong with new metals and electronics recycling facilities. SimsMM acquired 16 per cent of the existing shares of CTG from founder chairman Ankong Fang and Delco Participation B.V. (Delco), a Netherlands-based scrap metal company. Delco has granted SimsMM an option to acquire another 2 per cent of CTG. Subject to approval by CTG's independent shareholders, SimsMM will subscribe for a convertible bond and be issued warrants. After all instruments are exercised or converted, SimsMM expects to hold 20 per cent of CTG. To support growth, chairman Fang and Delco will re-invest two-thirds of the proceeds from SimsMM into convertible bonds issued by CTG on the same terms as SimsMM. "We are validating not only CTG's extraordinary growth prospects under the vision of chairman Fang and his leadership team but, as importantly, the shared cultures of our two companies manifested in unwavering commitments to creation of long-term shareholder wealth, the safety of our valued employees and the health of the environment and communities in which we operate and locate." Mercer has calculated that HDF Security holders have received a total security return of 9.78 per cent per annum compared to the S&P/ASX 200 Industrials Accumulation Index return of 4.50 per cent per annum since HDF's IPO in December 2004. On the other hand, APA security holders have received a total security return of 5.69 per cent per annum compared to the S&P/ASX 200 Industrials Accumulation Index return of 5.59 per cent per annum over the same period. Shares in Energy World Corporation have reached a three year high of 76 cents. The three year low was 19 cents in march 2009. The shares have risen sharply since October 2011 when they were 42 cents. As foreshadowed, ERM Power has increased its stake in the Oakey Power Station in Queensland to 83.33 per cent and has taken over as the operator of the power station. Oakey Power Station is a 332 megawatt (MW) two unit peaking power station with dual fuel capability, (gas and distillate, located about 150 kilometres west of Brisbane. The cost of increasing its stake from 62.5 to 83.33 per cent was $26.1 million. The company now operates three power stations with a combined capacity of 982 MW. Managing director, Philip St Baker, said Oakey Power Station is an outstanding asset which has operated at less than a 5 per cent capacity factor during its 12 year life and is expected to grow in value over coming years. Shares in Electrometals Technologies have fallen to a two year low of 0.9 cents. They have been slowly declining since their one year high of 2.5 cents last January. The new low followed an update that the company continued to experience difficulties completing sales in 2011, and the loss for 2011 will be approximately $2,900,000, compared to the loss in 2010 of $2,442,000. As part of its recent commitment to recruit new board members and senior management, Vmoto has appointed Blair Sergeant as non-executive director, while as foreshadowed, Trevor Beazley has resigned as non-executive director effective immediately. Mr Sergeant is a former director of Vmoto and was instrumental in the company being acquired by the then Optima Corporation Ltd in 2006. The board said Mr Sergeant's knowledge and operational understanding of Vmoto will help him make a valuable contribution, as was the case previously. Mr Sergeant holds a Bachelor of Business and a Post Graduate Diploma in Corporate Administration, both from Curtin University. He is a member of the Chartered Institute of Company Secretaries and an Associate of the Australian Society of Certified Practising Accountants. His experience includes senior management and executive positions with numerous listed companies across a range of industries. He is currently managing director of ASX listed Lemur Resources Ltd.
Lynas Corporation has increased the mineral resource estimate at its Mount Weld project to 23.9 million tonnes, at an average grade of 7.9 per cent rare earths oxide (REO), for a total of 1.9 million tonnes REO. Galaxy Resources has exported a 10 tonne trial shipment of mica from its Mt Cattlin project in WA. The trial shipment will be received and tested by leading international minerals group, giving the . Potential for long term sales agreement. Along with tantalum, mica is a co-product of spodumene production, from which comes lithium. Mica products are used in ceramic tile coatings. Other common uses include wallboards, toothpaste, cosmetics, makeup, glitter, paints, adhesives, lubricants and plastics. At Mt Cattlin, Galaxy separates the mica from spodumene and is developing the technology to further process it to create another potentially high-value marketable product. 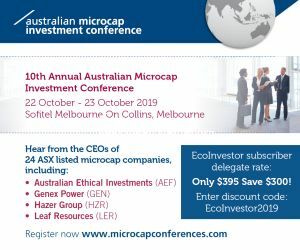 Shares in Algae.Tec have jumped to 63 cents following news of a Chinese equity partner for a biofuels and carbon capture facility in China, and the raising of $5 million through a placement to sophisticated and professional investors at 40 cents per share. The 50/50 equity joint venture in China is with Shandong Kerui Group Holding Ltd. The first project under the joint venture will be the construction of a 250-module algae biofuels facility in China to be equally funded by both parties. Executive chairman, Roger Stroud, said the facility will be the first of its size and type in the world, being purely focused on algae for the production of transport fuels. The facility will produce 33 million litres of algae derived transport oil and 33,000 tonnes of biomass per annum with a combined value of over $40 million; and capture 137,000 tonnes of waste carbon dioxide. The Kerui Group has extensive business interests in China, primarily in the manufacturing of oilfield and petroleum industry equipment, and power generation and building facilities. The Group has offices in 18 countries outside China. The Kerui Group said it expects the Algae.Tec carbon-capture technology will be well received by carbon emitting companies and Government in China. "China has pledged to reduce the amount of carbon emitted per unit of gross domestic product by 40 per cent by 2020," they said. As part of the capital raising, Algae.Tec will issue one option for every two new shares. The options will be American options with an exercise price of $0.75 and a maturity date at 31 January 2014. The Company will endeavour to have the options listed on the ASX. AnaeCo has appointment Patrick Kedemos to the position of managing director and chief executive officer. Chairman Shaun Scott said "I am very pleased that Patrick has accepted our invitation to join the AnaeCo board. Since joining the company as CEO a little more than four months ago he has shown tremendous energy and focus to reposition AnaeCo as a commercially focused and cohesive organization. Earth Heat Resources's application to consolidate its Geothermal Exploration Licence (GEL) has been approved by the South Australian Government. The consolidation means the company now has three expanded GELs covering its main areas of interest in the State: GEL 337, GEL 523 and GEL 525. Managing director, Torey Marshall, said "Consolidating our GEL portfolio in South Australia is an important streamlining of our residual Australian operations. We believe that future potential exists in the State, but we have to sensibly manage our operations within Australia against the backdrop of domestic and international investment climate for renewables." Hot Rock has expanded its geothermal portfolio in South America with the granting of the Turu geothermal tenement in southern Peru. Hot Rock now holds four tenements in Peru, and 13 in Chile. Another five tenement applications for volcanic geothermal prospects in southern Peru are still being processed and are expected to be granted this year. The Turu tenement is associated with a volcanic caldera complex and shows good field evidence for a geothermal reservoir with subsurface temperatures suitable for electrical power generation, said executive chairman Dr Mark Elliott. Lithex Resources said further rock chip analysis of its Moolyella Project near Marble Bar in WA shows the presence of significant grades of lithium. The lithium is in the same material previously announced to contain anomalous tin, tantalum, and a broad range of heavy rare earths and rare minerals. Papyrus Australia Ltd has received a United States patent for its original patent application - Method and Apparatus for Removing Sheets of Fibres from Banana Plants. This is an important milestone in ensuring successful commercialization of the Papyrus technology, said chairman Ted Byrt. "With our focus on technology development and licensing, the patents we hold in major markets such as the United States are an essential element in enhancing shareholder value." Water Resources Group (WRG) has entered a joint venture with Mandala Water Ltd, a subsidiary of private equity fund Mandala Capital AG Fund Ltd, to exploit all of WRG's existing and future products and technologies in its operating territories of India, Pakistan, Sri Lanka and Bangladesh. Mandala Capital Ag Fund invests in the agricultural sector and its founders and partners include longstanding Indian agriculture entrepreneurs as well as Altima Partners LLP, a multi-billion dollar investment fund with substantial investments in the global agriculture sector. The joint venture, with WRG owning 49 per cent, will be based in India and will enable WRG to enter the huge South Asia desalination market for industrial and municipal applications. The joint venture will also seek to develop new markets in seed and food preservation and food logistics, a major agricultural challenge in south Asia, using WRG's Plasma Chemical Reactor, a device that produces high-quality, low cost ozone from ambient air. Rapid increase in population, urbanization and industrialization in India has led to a significant increase in water requirement. In the next decade, the demand for water in India is expected to grow by 20 per cent, fueled primarily by industrial requirements which are expected to double, domestic requirements which are expected to grow by 40 per cent and irrigation requirements by 14 per cent. The Principal of Mandala Water, and chief executive of Mandala Capital, Uday Garg said "We invested in WRG at the time of its initial public offering and have taken the view that the application of their technologies in south Asia is going to greatly enhance the value of the company. We are looking forward to taking advantage of the leadership position that WRG's chemical free, modular desalination system gives us, and expect expansion into other agriculture sectors such as seed and seedling treatment, fresh produce preservation, aquaculture and fish farming in the near term."